The cover art for Matt Altobelli’s book was created by his sister, Ryann Burdick. Matt Altobelli, a third-year psychology student from Rochester, is publishing a personal memoir about the struggles he has faced dealing with post-traumatic stress disorder. Altobelli was diagnosed with PTSD after serving in the United States Air Force from 2006 to 2014. The book, “The American Nightmare and the Art of Failure,” documents Altobelli’s life and how PTSD has influenced his life choices. It will be published by iUniverse at the end of this year. Outside of classes and working on this memoir, Altobelli manages to find time to be highly involved with different campus groups. He is the president of the psychology club and is a member of Psy Chi, an international honor society for psychology students. He also works for the COLA Office of Student Services, is on the board for the Research Spotlight event for the psychology program, is involved with three research projects dealing with psychophysiology and neuropsychology and is working with a student start-up business. 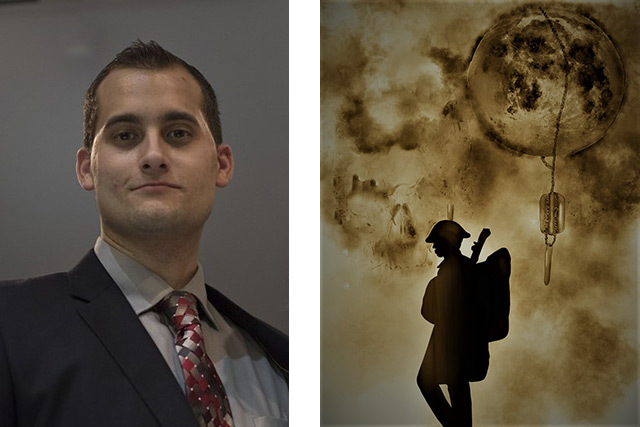 To learn more about Altobelli’s work or to learn about different resources available for people with PTSD, email him at mga4278@rit.edu. Answer: I was diagnosed with PTSD around 2014, but I had been living with PTSD since I went to Afghanistan in 2007. So from 2007 to 2014 I was just going on untreated. Even after I was diagnosed, I wasn’t really engaging with treatment. I just ignored it and went about living my life. I didn’t realize how much it affected the decisions I was making. I would make impulsive decisions that would ruin me and I would just think, ‘Man, I’m really self-sabotaging and I don’t know why.’ When I looked back, I saw I was going through the exact same cycle every time with every decision I made. I’m publishing my story because I want people to recognize those patterns before it’s too late. Or, if it is too late, they can learn how to bounce back from it instead of becoming a statistic. Twenty-two veterans commit suicide every day, and that number is way too high. Question: Can you give me some details on what the book is about? Answer: There are three parts to the book. Part one is “Aquired,” which basically describes how I got PTSD. It starts off in Afghanistan when I was in the military and I describe some of the things that happened to me as well as the exact event that caused my PTSD. Part two is “Consequences,” so it focuses on my life after the military and the consequences that it had on both my professional and personal life. The third part is “Recovery,” and it discusses what happened from when my last business went down the drain to when I went to the hospital and the vet center. It ends by discussing what that did for me and how it helped me get to where I am now. Question: Were you worried about sharing such an intimate part of your life with the public? Answer: At first, I thought about that and it was a question that a lot of people asked me, especially my fiancée. I’m at a point in my life where I don’t really care what people think anymore. Honestly, writing and publishing this and putting my story out in the world was kind of freeing. I don’t have to hide anything and I can be myself. Everyone has a past; I just put mine on paper. Question: Was it ever difficult recounting these memories for your book? Answer: Yes, some events more than others would put me in a bad mood. So much so that my fiancée would tell me she didn’t think I should write about a certain event or even write this book because it made me miserable. That is what I needed, though. I needed to experience these emotions and be miserable for a little while. Now, because of rewriting and rereading it over and over again, I’ve almost desensitized myself to it to the point that it doesn’t bother me as much. I can read it and I don’t automatically have a negative response to it like I used to. Question: Who do you hope will read this book? Answer: My target audience is people who have PTSD or family members of people with PTSD. I want people who have suffered through trauma and are looking for help to be able to find a resource in my book. At the end, I put my contact information in there so people who need someone to talk to or need help finding resources can reach out to me and I can point them in the right direction. If my story only helps one person, that’s still good with me. Question: Why do you think sharing your story is valuable for readers? Answer: By sharing my experiences, it might help someone recognize early on that they act the same way I did and that they should get help before it’s too late and they end up like me. Not only that, but again, this will help family members better understand people with PTSD. When they read this, maybe they can recognize some behaviors and understand why someone acts the way they do. With that knowledge, they can support that person or push them to get the help that they need before it’s too late.